Last night at the CMAC studio I was talking explosives. Big bangs, fireworks, pyrotechnics, black powder whatever you want to call it, to many of us British it will soon be November 5, and that means Bonfire Night. The day we sort of celebrate not having our Parliament blown up by poor old Guy Fawkes. The project called "Remember, Remember,' was made with a green screen back drop. This is called Chroma-Key and it allows you to mix multiple video sources, so in this instance in the picture on this page you see me against a green background when the program is completed in the editing room that green area will be a bonfire. If I was visiting a tropical island it could be a white sandy beach lined with fluttering palm trees or I could be shrunk to the size of a mouse and be climbing out of a hole in the wall. Chroma Key or green screen is what makes television magical, the only limit to its use is the producers or directors imagination. Last night I worked with a very good crew; Darcie, my wife and the usual host of 'Blindside Fresno' and Mary Bell who has produced several programs at CMAC , take a look at Mary Bell's Producer page,were working in the control room as directors with Steve and Ace Manelski, who produce Valley Veterans Forum. with me in the studio. This program began back at the end of July when I came up with the idea of producing and introducing a show about Guy Fawkes and Bonfire night. I submitted an initial proposal for the idea in August and when that was approved I began more detailed work. I contacted one of the members of CMAC 'Kiko' Romero who specialises in editing but had helped me a great deal in the initial production of 'Blindside Fresno,' on this occasion I wanted a particular look to the title sequence. He took on the project to create some really great titles from my ideas. Then I also began the work of in depth research for the program. One problem with history as any history major can testify is setting a beginning and end date for your story. You need specific dates on which to anchor a program, or essay. If you don't anchor a project with dates you cannot define a story. So while I did touch on some wider British and European history, most of the events for my project took place between May 1604 and January 1606. The dates when Fawkes met the main plotters for the first time and Fawkes execution. Being blind also makes taking on such a project difficult in the TV studio. Many might think of using a teleprompter or autocue. Just upload a script and read it to camera. Not reaally possible when you can't even see the camera. So I had to set to memory all the key names and dates of events. Along the way since I have never worked in a green screen studio before I had to learn what green screen can do, and more importantly what it can't. For this I arranged meetings with members of CMAC's regular staff. They are very important in my view. They want a project to work and they are always willing to help out and answer questions like; How do ...? or "What can I do with ...?" 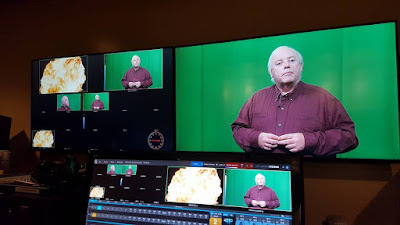 For instance I imagined my program with the graphics added as I spoke, but I was advised because the program will be full of graphics that it would save time and be more accurate to place the graphics in later and just record against a green screen. The program itself will run for just thirty minutes when finished. We recorded nearly one hours worth of video, in that there are mistakes, places that I forgot some piece of information and also where I was not happy with how I had said something. Most of that will be edited out and made to look better in the final product. I am looking to have the program aired on CMAC in time for November 5. That gives us two weeks in post production editing and a two week submission process. That seems a lot of time, but I now know from experience it is no time at all. This project was a great deal of fun. I learned some new things in the studio, got some insight in appearing before a full on studio camera, plus the funny part. Having my wife put me in make-up. It appears I have a very shiney head for TV. Funny I didn't realise that I am as bald as I am. Chalk up another positive for not being able to look in a mirror.